First of all, let's talk about Roco. Roco (pronounced row-co) is based in Sheffield and houses a variety of design, art, and tech businesses. They have 40 studio spaces, meeting rooms and event spaces, gallery, retail space, BROOD cafe bar and We Make Works makerspace. Andrea, co-founder of Roco, is a force to be reckoned with and has been spearheading Roco as a centre of creative excellence, a place where the public and private meet to Make, Work and Play. We have been following Andrea's journey for the last 4 years, from crowdfunding their financial model and renovating a row of houses, to opening their doors and developing incredible exhibitions, events and communities. When Eleanor Roosevelt said "a woman is like a tea bag; you never know how strong she is until you put her in hot water", Andrea certainly epitomises this. She has yielded such incredible motivation and inner strength to set up an incredible space that the creative community can call home and we are very proud that Andrea et al will be curating our third and final Creative Hub Forum in November, as part of our European Creative Hubs Network. The third and final hubs forum is being hosted by your amazing self, can you tell us about it - what sort of things are you planning? The We Are Next European Creative Hubs Forum is all about making a mark and asking what's next. Leading on from the first two forums expertly delivered by our fantastic partners in Belgrade, Nova Iskra (How Work Works) and Athens, BIOS (Syn) which very much defined the landscape of the sector and the value of our work and our networks, we are now looking at the nitty gritty of leadership. How do we (as creative hub managers) deliver value to our communities, what do we do when it all goes wrong and how can we work together to develop strength and resilience both on a personal and organisational level. What does that mean in a practical sense? It means that we are here to work! The Creative Hub Forums and events are always a vibrant blend of work and play and we are here to keep that tradition up and squeeze as much as we can out of the 2 days we have together. Who are you looking forward to talking to? The Creative Hubs Network has grown over the last 2 years to include 160 different creative hubs from 35 countries, which just shows the scale of this quite often grassroots and self-initiated movement. We won't be able to host everyone at the We Are Next forum but I am looking forward to seeing some of the new faces who have joined us recently. Why is it exciting for Roco to host the forum? Being invited to join the Leadership Group and then asked to deliver the 3rd forum is hugely exciting, both for the organisation and for me on a personal level - as a hub founder. Roco will be 2 years old the week of the forum and it's incredible to think how far we have come in that time. To have an organisation like the British Council say to you early on 'we believe in you, come and be part of this fantastic network we are developing' just as we opened our doors, was a huge confidence boost. Now, to be able to bring that network to Sheffield and to support and nurture them in return is a real privilege. What do you hope people take away from Sheffield? Often described as a village rather than a city because of the friendliness of the people, I think people will get a sense of a culture bubbling away under the surface and people's desire and passion for Sheffield to emerge as the creative city it is. If people have time after the forum - handily planned to lead into the weekend - I would say spend a day visiting our galleries and indie stores, soaking up the cafe culture and if weather allows it, taking a trip out to the Peak District where the views of the rugged landscape are just breath-taking. What would you like fellow hub managers attending the forum, to go away with? What struck me at the last forum was what a diverse group we are in terms of the type of hubs we lead, the scale of the spaces we manage and the impact we create, but yet the huge amount we all have in common. Hub managers should go away understanding the enormous value they deliver to our broader economies and culture, in providing space for the creative industries to thrive and for innovation to flourish. But importantly, all of the hub managers should leave with a sense that as a builder of communities there is a place, a network, a community for us also. A place to learn, to share and to flourish. 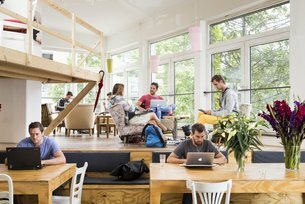 How can creative hubs get involved in the forum? We are looking for over 100 creative hubs from across Europe to attend the forum. Applications are now open, with successful applicants having travel and accommodation (2 nights) covered. Register now for the forum here. This forum is part of our European Creative Hub Network (ECHN) programme, contributing to the project's overall objective of strengthening and empowering creative hubs across Europe. ECHN is co-funded by the European Commission.